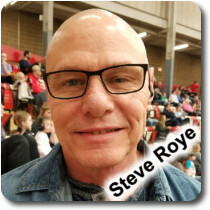 Over the past decade, Steve Roye has established himself as one of the world’s leading experts on comedy material development, delivery methods and comedy business strategies. Steve is the best selling author of the globally recognized Killer Stand-up Comedy System/Online Course which has been sold in over 20 countries around the globe. He is also the inventor of the Comedy Evaluator Pro performance evaluation software for comedy professionals, which is featured in the stand-up comedy documentary “I Am Comic”..
As a headlining comedian based out of California and Hawaii during his active stand-up career, Steve was able to headline major 600-1500 seat venues, comedy clubs as well as open for major bands and comedians – without a single stand-up comedy TV credit to his name. Click here to review Steve’s professional comedy resume prior to his retirement from active stand-up comedy performances. In recent years, Steve has been a highly sought after comedy entertainment consultant, providing training to established and respected organizations such as the International Ventriloquist Convention and the Christian Comedy Association, as well as providing one-on-one coaching for comedians and public speaking professionals at all levels as his busy schedule permits.